CPSI NewsWire brings you market updates on Mongolia, compiled by CPS International, a Mongolian marketing arm of CPS Securities, a Perth, WA based stockbroking and corporate advisory firm, specialising in capital raising for mining and junior stocks. Wish to subscribe or unsubscribe? Let me know. January 31 -- General Mining Corporation Limited (GMM) (ASX: GMM) is very pleased to advise that Investmet Ltd (Investmet) has agreed to take a strategic stake in GMM and to assist in raising up to $1.9 million through a two stage capital raising. The capital raising will initially comprise a Placement to Investmet and/or its nominees followed by an Entitlement Issue, fully underwritten by Investmet. Investmet will also procure the purchase by GMM of two complementary Australian precious metal assets, further enhancing the potential of GMM's Australian portfolio. GMM's Chairman, Michael Wright said: "Investmet's strategic investment will provide us with funds to support our ongoing exploration efforts in Australia and Mongolia, where we already have an excellent suite of exploration projects, as well as provide access to additional assets and technical support, increasing our potential to make a significant discovery. Investmet has a proven track record and their support for GMM is a positive step forward for our company and we are looking forward to working closely with the Investmet team." Stage 1 of the capital raising will comprise a placement to raise $1.0 million, through the issue of 20,000,000 fully paid ordinary shares at $0.05 per Share together with 20,000,000 attaching unlisted options at staggered exercise prices (Placement). The Placement will be to Investmet and/or its nominees and is subject to GMM shareholder approval which is expected to be sought under section 611 item 7 of the Corporations Act during April 2012. Shareholder approval will also be sought for the acquisition by GMM, facilitated by Investmet, of two precious metal assets in Western Australia (Acquisitions). The final terms of the Acquisitions will be put to shareholders at the same meeting to approve the Placement. Stage 2 of the capital raising will comprise a fully underwritten one (1) for five (5) non-renounceable pro-rata entitlements issue (Entitlement Issue), following completion of the Placement and the Acquisitions. This offer will be made to all GMM shareholders with registered addresses in Australia and New Zealand on a record date to be announced in due course, and will raise approximately $0.9 million. The proceeds from the capital raising are to be used to explore both the existing and the acquired assets and for general working capital purposes. The Placement remains subject to due diligence enquiries being conducted to Investmet's satisfaction and Investmet Board approval, by 31 January 2012, and the underwriting is subject to execution of an appropriate underwriting agreement on usual and appropriate terms, including termination clauses if GMM Shareholders do not approve the Placement or the Acquisitions. Investmet is an unlisted public company managed by experienced industry professionals and supported by private high net worth investors (including its directors and management). It was created to pursue a variety of investment opportunities in resource projects with strong future demand growth and to incubate, develop and enhance the value of these investments through financial, technical and corporate support. Investmet is managed by Executive Chairman Michael Fotios, who is a geologist specialising in economic and structural geology, with extensive experience in exploration throughout Australia and overseas. In the last 34 months Investmet has assisted and taken strategic positions in ASX‐listed Northern Star Resources Ltd, Target Energy Ltd, Pegasus Metals Ltd and most recently Genesis Minerals Ltd (subject to shareholder approval). All of these investments were completed at a premium to the prevailing market price and significant share value appreciation has been experienced by all of these listed companies especially Northern Star Resources Ltd, where the market capitalisation has grown from $1.3 million in March 2009, when Investmet became involved, to approximately $350 million today. Investmet has agreed to subscribe for 20,000,000 fully paid ordinary shares at $0.05 per share together with 20,000,000 attaching unlisted options for nil consideration. 6,666,667 of the options will be exercisable at $0.075 within 12 months of issue; 6,666,667 options will be exercisable at $0.10 within 24 months of issue, and 6,666,666 options will be exercisable at $0.125 within 36 months of issue. No placement, corporate advisory or other capital raising fees will apply to this initial Placement. The Placement will be made to sophisticated and/or professional investors under section 708 of the Corporations Act, without the issue of a prospectus. The subsequent Entitlement Issue by way of a prospectus will raise approximately $0.9 million through a fully underwritten non-renounceable entitlements issue of up to 18,006,925 new Shares (plus any additional Shares required to be offered if any existing Options are exercised prior to the Record Date). One New Share will be offered for every (5) five Shares held at the Record Date, at an issue price of $0.05 per share. Free attaching Options will be granted for nil consideration for each New Share allotted under the Entitlement Issue, comprising a total of 18,006,925 Entitlement Issue Options, of which 6,002,309 will be exercisable at $0.075 within 12 months of issue, 6,002,308 will be exercisable at $0.10 within 24 months of issue, and 6,002,308 will be exercisable at $0.125 within 36 months of issue. Subject to an underwriting agreement being entered into, Investmet, as underwriter to the Entitlement Issue, shall have the right to place any shortfall in the Entitlement Issue at its sole discretion, subject to GMM shareholder approval being obtained where required under Listing Rule 10.11 in general meeting. The fee associated with the underwriting will be the greater of 5% of the funds raised or $50,000. GMM shareholder approval will be sought to appoint Investmet's proposed nominee director, Mr Michael Fotios, being Investmet's current Executive Chairman, at the Meeting. Mr Fotios is a Geologist specialising in economic geology with 27 years of extensive experience in exploration throughout Australia in gold, base metals, tin, tantalum and nickel and taking projects from exploration to feasibility. He has previously held positions with Homestake Australia Ltd and Sons of Gwalia Ltd. He was Managing Director and a Director of Tantalum Australia NL (now ABM Resources Ltd) from December 1992 to December 2005. He was then a director of Galaxy Resources Ltd from April 2006 to December 2008. Mr Fotios is currently a director of the listed Northern Star Resources Ltd and Pegasus Metals Ltd as well as being the founder and Executive Chairman of the unlisted Investmet Ltd.
GMM intends to use the funds from the capital raising to explore both the existing and the acquired assets and for general working capital purposes. Investmet proposes to facilitate the purchase of two assets by GMM that it has negotiated in good faith with the respective vendors via one of its subsidiaries, subject to satisfactory due diligence being completed by GMM. Both assets, being the Mercury Hill Project and the Chesterfield Project, are gold assets in Western Australia and have mineralisation already identified. The information relating to the exploration targets is based on insufficient exploration to define a Mineral Resource and it is uncertain if further exploration will result in the determination of a Mineral Resource. GMM views this agreement with Investmet as a significant step in the growth of the Company. It is also encouraging that Investmet has seen fit to provide this funding at a very competitive price compared to recent trading in the Company's shares. This funding will assist in advancing GMM's highly prospective portfolio of assets in Australia and Mongolia. Vancouver, B.C., January 30 (via Thenewswire.ca) -- Meritus Minerals Ltd. (MML) (TSX-V - MER) (the "Company") is pleased to advise of the receipt of results of a preliminary metallurgical test of selected surficial oxidized mineralization from the Toordogiin Shil Prospect at the Gutain Davaa Project, Mongolia. The results are very encouraging and indicate that fine grinding will fully liberate the very fine gold mineralization and that bench scale testing achieves in excess of 99% gold recovery on some samples. Best results are tabulated below. These results are considered most encouraging. Further tests of oxidized and primary mineralization are required to enable optimum gold recoveries to be achieved. However this data suggests that for oxidized material optimum recoveries in excess of 92% will be achieved when grind size exceeds 65% passing 75 microns, free cyanide is between 100ppm and 200ppm, and residence leach time is between 12 and 24 hours. The work was performed by Conres, a Mongolian organization in their facilities in Ulaan Baatar. A selected 112kg sample of oxidized surficial mineralization was crushed and delivered to Conres. A split of the submitted sample was wet screened and subject to screen fire assay. Head grade of this sample was determined as 5.14g Au/t. After grinding tests leaching was carried out in Bottle Roll leaching tests. Pulp density was maintained at 50% solids and pH maintained above 10.5. From each of four sub samples three 500 gram sub samples were cut and tested with different levels of cyanide added, 100, 200 and 300 ppm. Progress of leaching was recorded at 12 hours, 24 hours and 48 hours following which gold head grades of the individual samples were calculated. The Gutain Davaa project contains seven gold targets of which only the Toordogiin Shil prospect has been drilled. The Toordoriin Shil prospect is located in the contact zone between strongly altered granodiorites and meta sediments and is considered to be of orogenic style. During 2010 / 2011 Meritus completed 6700m of diamond drilling in 58 holes many of which encountered high grade gold mineralization,(ie.28.6m of 8.78gAu/t,8.05m 0f 10.7g Au/t, 16.0m of 7.73 gAu/t,7.0m of 16.4 gAu/t ,2.0m of 44.04g Au/t,-all previously reported). Meritus is preparing information for filing in support of an application to register the resource at Toordogiin Shilwith the Mongolian National Reserves Committee. The metallurgical report referred to is part of that information. ULAANBAATAR, MONGOLIA--(Marketwire - Jan. 30, 2012) - Undur Tolgoi Minerals Inc. ("UTM" or the "Company") (CNSX:UTM) is pleased to announce that its Board of Directors has reviewed and unanimously approved an exploration Program (the "Work Program") for the Company's Mongolian property. The Company's wholly owned license ("Undur Tolgoi") consists of approximately 9,260 hectares of land located approximately 100 kilometers east north east from the world-class copper gold porphyry Oyu Tolgoi. As the geological setting of Undur Tolgoi appears to be similar to that of Oyu Tolgoi, the aim of the Work Program is to identify any base metals and/or gold anomalies. A soil sampling program over the entire tenement of approximately 1,540 samples, taken on a 250 meter x 250 meter grid has been designed to identify any anomalous areas within the tenement. Previous work has identified two interesting zones of anomalous copper, gold and silver. From the results of the soil sampling, a hydrothermal system will hopefully be identified using indicator elements (As, Bi, Li, W, S and Au) and a tighter soil Program may be required to further define the anomalous zones. Gravity survey to identify contrasting lithologies beneath the colluvial cover. Magnetic and Gravity surveys will be initially run to gather a baseline of the tenement. After analyzing the results from the Magnetic and Gravity surveys an IP survey will be run over the tenement as IP will be used to tie into the Magnetic and Gravity survey. The commencement of the Work Program is expected to take place mid to late February 2012 with 1500+ soil samples expected to be delivered to an accredited laboratory located in Ulaanbaatar, the capital of Mongolia, for further analysis. UTM further expects to have the results from the laboratory by mid May 2012. These results would then be used as the basis from which to determine the appropriate size and placement of the Magnetic, Gravity and IP surveys. UTM's Chairman, Mr. James Passin, stated, "I am delighted with UTM's progress since completing its financing in November 2011. The entire UTM team is looking forward to the commencement next month of our Work Program over Undur Tolgoi. I thank our shareholders and our employees for their continued support of UTM"
• 13,165m of diamond drilling completed at the Selenge Iron Ore Project. Three of four primary targets were drilled. The program will recommence in the second quarter of 2012. • Major new discovery made at the Dund Bulag Prospect where four of the five holes intersected extremely wide zones of iron mineralisation. Assays are pending. • Metallurgical test work program has commenced, with the results to be input to a pre Scoping Study due mid 2012. This result along with previously announced intersections from the Cughur and Gaans Discoveries sees Voyager Resources Limited (Voyager or the Company) continuing to drill some of the best copper mineralisation reported in Mongolia, external to the giant Oyu Tolgoi Copper Deposit. Voyager acquired an additional 30% interest in the KM Project in Mongolia during the quarter. This acquisition takes Voyager's ownership of the Project to 80%. Completion of this transaction was another significant achievement in the Company's objective of controlling and developing a "World Class" copper deposit in Mongolia. During the quarter Voyager also placed an Exploration Target* of between 50 and 150 million tonnes at between 0.8 and 1.5% copper on the hydrothermal breccias at the KM Project. This Exploration Target does not include the larger copper porphyry stock targets, which were identified and are currently being drilled for. Mineralisation has also been intersected in drilling on a further two hydrothermal brecciaprospects, namely Gaans North and Zam Daguukh, taking these targeted pipes to five, plus a sheeted vein system at the Elstei Prospect. Initial assay results for these areas are expected in the coming weeks. The substantial increase in exploration activity in Mongolia during the latter stages of 2011 resulted in a backlog of assay results. The Company expects to clear the backlog during the first quarter of 2012. It was also reported in the quarter that the Company believes a porphyry stock or cluster of porphyry stocks, exists at the KM Project which act as feeders to these shallow hydrothermal breccias. Voyager recently commenced a separate drill programme aimed at identifying the porphyry stock or stocks. Voyager has completed 173 Reverse Circulation (RC) drill holes, 48 diamond core drill holes and 19 diamond core drill tails on the project. Ongoing exploration and drilling continues to strengthen Voyager's belief that the KM Project is an exceptional porphyry copper project. Voyager continued with an aggressive exploration programme at the KM Project in the South Gobi region of Mongolia during the quarter. Voyager still maintains three diamond core rigs operating on site, having recently suspended the RC drilling rigs due to reduced air drilling capacity caused by the colder winter conditions in December 2011. It is expected though that RC drilling will recommence in March 2012. Two of the diamond core rigs are now focused on drilling for two individually targeted copper porphyry stocks, whilst the third diamond rig continues to operate on the shallow high grade hydrothermal breccia systems of Cughur, Gaans, Aranjin, Gaans North and Zam Daguukh prospects. It is the Company's strategy to continue its focus on these hydrothermal breccia targets as this drill programme will assist with the calculation of initial resources before the end of June 2012. The Company's separate drill programme aimed at identifying the porphyry stock or stocks will continue. Drilling at the KM Project continues to intersect some of the best copper mineralisation reported in Mongolia outside of the giant Oyu Tolgoi deposits (approximately 3.75 billion tonnes at 0.98% copper and 0.38 g/t gold**) with results to date remaining highly encouraging from the discoveries of Cughur and Gaans and now Aranjin. In addition, broad intersections of copper mineralisation have been identified in recent drilling at Gaans North and Zam Daguukh, plus the sheeted vein system at Elstei. Delayed analytical results from the sample backlog at the laboratory are expected to be cleared over the coming weeks with approximately 50% of the completed drill holes to date remaining outstanding. January 31 -- Aspire Mining Limited (ASX: AKM, "Aspire" or "the Company") is pleased to present its December 2011 Quarterly Report. Aspire is focused on developing its world-class 100%-owned Ovoot Coking Coal Project ("Ovoot Project") in Northern Mongolia and advancing the region's infrastructure to bring Ovoot coking coal to world markets. Aspire's other Mongolian assets include the Nuramt Coal Project (100%), Jilchigbulag Coal Project (100%) and the Zavkhan Iron Ore Project (earning 70%). o Infill drilling totalling 44 holes and 9,200m completed. o Sedgman has completed a wash plant design that targets an 80% yield with an 8% ash product. o Early investigations have identified potential areas for significant water reserves within, or in close proximity to, the Ovoot Project. o Studies have identified a local power provider that can provide mains power, direct to the Ovoot Project facilities. o BOOT options are available for the required Ovoot Project facilities. • Exploration drill hole DH314 extends New Coal Discovery area by 1km to the west. • Noble Strategic Alliance and Marketing Agreement announced. • Completed a placement to raise A$32.8 million from institutional and sophisticated investors in October 2011. • Continued the drilling programme through winter. • Continued to expand the management team to support Ovoot development. o Rail Pre-Feasibility Study into the Erdenet to Moron and Moron to Ovoot rail lines substantially complete. o Agreed to issue Northern Railways LLC shares to potential users of the Erdenet to Moron rail line. January 30 -- The Directors of Mongolian Resources Corporation Limited (ASX: MUB) (Mongolian Resources or the Company) are pleased to present the December 2011 Quarterly Activities Report. This is the Companies third quarter since the merger with the Mongolian Assets in April, 2011. During this quarter the Company has continued to outline mineralisation at its key Mongolian gold projects of Sujigtei and Blue Eyes and continues to stockpile ore for future processing. Resource approval and extension of mining license 5707A for 30 years on the Blue Eyes Gold Mine was granted by the Mongolian Government during this quarter. The Company also received full construction permitting for building of the larger plant facility of 400 tonnes per day CIP plant and intends to continue construction of this facility Q2, 2012. Outstanding operational permits are the cyanide permit and environment operational permits. The Company is working closely with the Department of Environment on these permits to be fully permitted for large scale production when the plant is completed in Q3. Our target is by the end of the Q1, 2012 to commence operations on its fully constructed 100 tonne per day floatation plant facility. The Company has more than 4,500 tonnes of underground quartz ore on its ROM Pile ready for processing. In addition a further 8,000 tonnes of tailings grading more than 3 grams / tonne gold has been stockpiled ready for treatment. • Quotations for Ereeny mine plan design have been received from three reputable design companies in China. January 30 (Mogi) Disclosure notices to SouthGobi Resources reveals Ivanhoe Mines (TSX:IVN, NYSE:IVN) President Mr. John Macken exercised 150,000 options at C$2.8, and 143,658 options at C$13.76 on January 23. Subsequently sold 50,000 shares at average US$17.138 on January 24 and 243,658 shares at average US$17.26. Ulaanbaatar, Mongolia, January 30 /MONTSAME/ Five stock trades were held at Mongolia's Stock Exchange on January 23-27. In overall, 990.8 thousand shares were sold of 75 joint-stock companies totaling MNT 445.8 million. Index TOP-20 was 20865.93 points increasing 686.23 units or 3.4% against the week earlier. The total market capitalization was set at MNT two trillion 70.7 billion increasing MNT 71.4 billion or 3.5%. Shares of "Selenge sureg" /100.2%/, "Khargia" /74.7%/, and "Monasar" /74.7%/ increased, but shares of "Ereentsav" /27.6%/, "Gutal" /26.7%/, and "Khasu mandal" /24.5%/ decreased. 7 stocks closed higher, 28 shares declined and 10 shares remained unchanged. Shares of "Remikon" /461.1 million units/, "Genco tour bureau" /229.7 thousand units/ and "Olloo" /73.2 thousand units/ were the most actively traded in terms of trading volume and in terms of trading value--"Remikon" (MNT 75.4 million), "APU" (MNT 58.3 million), and "Tavantolgoi" (41.3 million). Faction also proposes to give the government the right to decide whether to give these extra shares to students as they are being given money for tuition. They also support giving companies the opportunity to subscribe to shares. Ulaanbaatar, Mongolia, January 30 /MONTSAME/ The faction of the Mongolian People's Party (MPP) backed on Monday altering the 39th parliamentary resolution on giving additional 10 per cent of stocks to people. The faction members reached a final position to give the additional stocks of 10 per cent to other 10 per cent of the Tavantolgoi coal deposit's shares to be owned by people. It means that the people will receive 20 per cent of the TT deposit. The faction considered as necessity to create an opportunity for national enterprisers to own certain part of the stocks. Then, it also considered as necessity to let the government tackle other matters including the TT stocks for students. It has been calculated that each citizen will have 1,072 units of the stocks if the population get 20 per cent of the total stocks. After setting of the stock's nominal value, the citizens will make own decision to choose the stocks or cash equaling to 1,072 stocks. The faction backed a draft package law on court submitted by the President, and then decided to set up a related working group. A draft law on local election has been discussed as well. January 31 (Montsame) МАН-ын бүлэг өчигдрийн хурлаараа УИХ-ын 39 дүгээр тогтоолд өөрчлөлт оруулах асууд­лыг хэлэлцээд иргэдэд олгох 10 хувийн хувьцаан дээр нэмж 10 хувийн хувьцаа нийт 20 болгоё гэдэг байр суурь дээр эцсийн байдлаар тохирчээ. Харин үндэсний аж ахуйн нэгжүүдэд хувьцааны тодорхой хэсгийг худалдах боломжийг олгох нь зүйтэй гэж үзсэн байна. Бусад асуудлыг Засгийн газар журам гарган зохицуулах боломж олгох нь зүйтэй гэж үзжээ. Тухайлбал: 170 орчим мянган оюутан 500 мянган төгрөгөө бэлнээр, нэг сая төгрөгөө сургалтын төлбөр хэлбэрээр авчихаж байгаа учир тэдний тухайд хувьцааг хэрхэхийг Засгийн газар шийдэх болж байна. Иргэдэд олгох хувьцаа 20 хувь гэж шийдэгдвэл иргэд нийт 1072 ширхэг хувьцаатай болох бөгөөд хувьцааны нэрлэсэн үнэ гарсны дараа ард иргэдээр сонголт хийлгэх аж. Бэлэн мөнгөө авахаар сонгосон иргэдийн мөнгийг олгохдоо үндэсний аж ахуйн нэгжүүдэд худалдсан хувьцааны мөнгө орж ирэхэд олгох нь зүйтэй гэж бүлэг шийдсэн байна. Харин 55-аас дээш насны эмэгтэй, 60-аас дээш насны эрэгтэйчүүд болон 108 мянга орчим хөгжлийн бэрхшээлтэй иргэдэд олгоход шаардагдах хөрөнгө энэ оны төсөвт тусгагдаад байгаа юм. Мөн бүлгийн хурлаар Ерөнхийлөгчөөс санаачлан өргөн барьсан Шүүхийн тухай багц хуу­лийн төслийг хэлэлцээд ажлын хэсэг байгуулахаар болжээ. Бүлгээс бас өөр нэг ажлын хэсэг байгуулахаар болсон нь Олон хүүхэдтэй эхчүүдэд олгох урамшуулал, 1995 оноос өмнө болон хойно тэтгэвэрт гарсан иргэдийн тэтгэврийн зөрүүг арилгах, Засгийн газраас өргөн барьсан Суурь тэтгэврийн тухай хуулийн төслүүдтэй холбоотой юм. УИХ дахь АН-ын бүлэг ч эдгээр хуулийн төслөөр ажлын хэсэг байгуулахаар болсон юм байна. Орон нутгийн сонгуулийн хуулийн төслийг ч МАН-ын бүлэг хэлэлцжээ. Засгийн газар хуулийн төсөлд саналаа өгчихвөл энэ долоо хоногт хэлэлцэж эхлэх боломжтой гэнэ. Одоо хүчин төгөлдөр мөрдөж байгаа хуулиар УИХ-ын болон Орон нутгийн сонгуулийг 6 дугаар сард зэрэг явуулахаар байгаа юм. Гэвч УИХ-ын сонгуулийн хуульд нэлээд өөрчлөлт орсон учир Орон нутгийн сонгуулийн хуульд өөрчлөлт оруулах шаардлагатай болж байгаа аж. Тухайлбал: УИХ-ын сонгуулийн санал авах хугацаа нь орой 20 цаг, орон нутгийнх 22 цаг, саналын хуудсыг УИХ-ын сонгуулийнхийг автоматаар, орон нутгийнхийг гараар тоолохоор байгаа учир энэ мэт цэгцлэх ёстой олон асуудал байгаа юм. Бүлгийн дарга Ө.Энхтүвшин сэтгүүлчдийн асуултад дараах хариулт өглөө. -Танай бүлэг УИХ-ын болон Орон нутгийн сонгуулийг зэрэг явуулах боломжтой гэж үзэж байгаа юу. Эсвэл өөр байр суурьтай байна уу? -УИХ-ын болон Орон нутгийн сонгуулийг нэг өдөр явуулах асуудлыг өнөөдөр хүчин төгөлдөр хэрэгжиж байгаа хуулинд тусгасан байгаа. Түүнээс бус аль нэг намын байр суурь биш юм. Олон нийтийн зүгээс хоёр сонгуулийг нэг өдөр явуулах нь бэрхшээлтэй байна, тиймээс салгах нь зүйтэй гэсэн санал гарсан. Үүнийг УИХ дээр ярилцана. -Хувьцааны нэрлэсэн үнийг тогтоосон уу? -УИХ дээр хувьцааны нэрлэсэн үнийг тогтоогоогүй байна. Урьдчилсан байдлаар олон улсын санхүүгийн байгууллагууд "Тавантолгой"-д ямар хэмжээний үнэ өгснөөс нь шалтгалан, нэг хувьцаа нь 1000 орчим төгрөг байх болов уу гэсэн яриа гарсан байна лээ. Үүнийг одоогоор тогтоогоогүй байгаа. Гэхдээ нэрлэсэн үнэ гарч таарна. January 29 (Bloomberg via Moscow Times) Oleg Deripaska's En+ Group plans to invest at least $1.5 billion to increase coal production by almost 50 percent by 2020 and is studying acquisitions in Russia, Mongolia and Indonesia. The En+ coal division mined 16.8 million tons last year and plans to dig 25 million tons in 2020 by expanding current mines and through acquisitions, managing director Andrei Churin said. While about 90 percent of the company's coal is now used to generate power for Deripaska's United Company RusAl, En+ plans to sell half of its output to other customers in Russia and Asia by 2020, Churin said. En+ is interested in bringing all its coal assets under one company and may then study an initial public offering, he said. The main asset is Vostsibugol in Irkutsk, along with other sites in western Siberia. While RusAl holds half of the Bogatyr Komir project in Kazakhstan, no talks or decisions on any acquisition of the stake by En+ have so far taken place, Churin said. Deripaska is expanding production to meet growth in demand for commodities in Asia. RusAl, in which En+ owns 47 percent, was the first Russian company to sell shares in Hong Kong, raising $2.2 billion in an initial public offering two years ago. His power company EuroSibEnergo also formed a venture with China Yangtze Power last year after postponing a Hong Kong IPO. Deloitte Touche Tohmatsu Limited (DTTL) announced today it has established a new member firm in Mongolia after reaching an agreement with leading local Mongolian professional services firm, Onch Audit. The new firm, Deloitte Onch LLC, will offer a full range of professional services, including audit, tax, consulting, and financial advisory to clients in one of the world's fastest growing economies. Mongolia is a fast-growing market in the Asia Pacific region, with its significant natural resources and growing number of domestic enterprises requiring top-quality professional services. Deloitte Onch LLC is poised to leverage the increased opportunities in the region, particularly in the energy and resources sector. For example, the Deloitte Global Mining Industry team, an established network of experienced Deloitte member firm professionals in every country that has significant mining activity, will add great value to its services to mining clients operating in Mongolia. "In addition to adding a new firm to our vast global network, we are delighted to be expanding in what is fast becoming a critical market for the Asia Pacific region and the global economy as a whole," said Barry Salzberg, Global CEO, DTTL. "By combining the deep local knowledge of Onch Audit with specialist expertise from Deloitte member firms, the network is well-positioned to help new and existing clients in Mongolia become leaders in their market or advance their existing market leadership." The agreement will connect the newly formed Deloitte Onch LLC with support from a globally connected network of professionals in more than 150 countries. The new member firm will continue to be led by founder Onchinsuren (Onch) Dendevsambuu, a former senior auditor at Arthur Andersen and Ernst & Young in Ulaanbaatar and Moscow. Onchinsuren has 15 years of experience in audit, tax, and advisory, serving both multi-national companies and local clients. "This is a very exciting time for the new Deloitte member firm in Mongolia," said Onchinsuren. "We are proud to be joining a network so respected for its world-class service, innovation, and ethics. With the support of a global network of member firm specialists, I am confident that Deloitte member firms can continue to exceed clients' expectations." Onch Audit LLC (Onch Audit) was founded in January 2004 and has since become a leading firm in the region. The Deloitte Onch LLC office currently employs a staff of 50 with plans to recruit an additional 15 over the coming months. "We are delighted to have such dedicated professionals join Deloitte member firms in the Asia Pacific region," said Chaly Mah, Regional Managing Director, DTTL Asia Pacific. "I look forward to working closely with Onch and her colleagues to develop business in Ulaanbaatar, delivering exemplary services to existing clients, and furthering Deloitte member firms' local and international client base in the region." Deloitte refers to one or more of Deloitte Touche Tohmatsu Limited, a UK private company limited by guarantee, and its network of member firms, each of which is a legally separate and independent entity. Please see http://www.deloitte.com/about for a detailed description of the legal structure of Deloitte Touche Tohmatsu Limited and its member firms. Deloitte provides audit, tax, consulting, and financial advisory services to public and private clients spanning multiple industries. With a globally connected network of member firms in more than 150 countries, Deloitte brings world-class capabilities and high-quality service to clients, delivering the insights they need to address their most complex business challenges. Deloitte's approximately 182,000 professionals are committed to becoming the standard of excellence. January 31 (news.mn) Secretary General of Parliament Office Ts.Sharavdorj has told our correspondent that the current session of Parliament will go into recess on February 10. He said the autumn session is working overtime passing draft laws and implementing Government programs. A recess must begin on a date prescribed by law, and the Speaker's managing council has decided to begin the recess on February 10. During the recess, the Government will be fully staffed, and Ts.Sharavdorj said it needs to hard work until the spring session begins. Ts.Sharavdorj said the Government has not yet implemented many projects and programs, and Parliament has warned the Government about that. January 31 (news.mn) An official with Mongol Bank's Economic Department and three officials from the Standardization Measurement Office have been detained since last week for their alleged roles in a gold scheme. Sources say about 20 kg of gold was sold through Mongol Bank. But the gold did not meet international standards for quality, and the bank asked the Prosecutors' Office to investigate the matter. As a result of the investigation, the four officials were detained. The investigation is ongoing, and there are reports that high-ranking officials might be implicated, but investigators are refusing to discuss the case. January 30 (news.mn) The Civil Will Party (CWP) held its eighth assembly on January 28, with some 500 delegates from the CWP and the Green Party (GP) taking part. Delegates discussed decisions reached at the seventh assembly, when the CWP and the GP decided to form an alliance. But the State Supreme Court has not yet approved the parties' alliance. That is why they decided to discuss the issue again and to change the name of the CWP. Delegates voted to change the party's name to the Civil Will Green Party (CWGP) and to revise the party symbol and flag to reflect the change. Delegates also gave preliminary approval to a new party structure, and appointed several managing officials, including MPs S.Oyun and D.Enkhbat, to discuss the issue. January 30 (news.mn) The MPRP observed its first anniversary on January 27 and organized a conference in conjunction with the anniversary. MPRP Chairman N.Enkhbayar said the party now has 35,000 members and its own building. He also said the MPRP is working to contribute its share to establishing fairness in the country. He said the party sent suggestions for a draft election law and a draft law on police to Parliament. At the conference, 1,000 new members were officially enrolled in the party, and they received party certificates. A lawyer, O.Baasankhuu, was among the new members. He advised party officials who registered the party with the State Supreme Court. It is his first time in politics. MOSCOW, January 30 (RIA Novosti) A Russian Army delegation has started a five-day visit to Mongolia to discuss preparations for a joint exercise, the Defense Ministry said on Monday. The delegation, led by Maj. Gen. Valery Sharagov, chief of staff of a large combined-arms unit in the Eastern Military District, will conduct the first round of consultations on this year's exercise, Selenga 2012. It is due to be held on Russian territory. Last year's exercise took place in Mongolia and rehearsed counterinsurgency operations with up to 250 troops on each side. January 27 (Oxford Business Group) Last year saw the prospect of Mongolia's vast untapped natural mineral wealth drive heady levels of investment and growth, with the government aiming to harness the momentum by diversifying the economy and improving infrastructure, employment and housing. However, Prime Minister S. Batbold's administration will likely face political pressures over protecting the country's resources in the lead-up to this June's election. The National Statistical Office of Mongolia (NSO) revealed in October that GDP grew 16.7% in the third quarter of 2011, in line with an annual average expected to outperform the 2010 figure of 7%. However, it is expected that the Oyu Tolgoi copper and gold mine alone will boost Mongolia's economic growth and GDP by 25% or more when production starts in late 2012 or early 2013. Confidence in the expected growth due to Oyu Tolgoi and a vast coking coal mine, Tavan Tolgoi, was reflected in government spending, with the government announcing a state budget in October that projected revenues of MNT6.4trn ($4.99bn), some 35.4% of GDP, and expenditures of MNT7.1trn ($5.54bn), or 39.5% of GDP. The projected deficit was MNT700bn ($546m), approximately 4.1% of GDP. Ulaanbaatar said the budget was aimed at stabilising revenues, ensuring the equitable share of mining revenues among the population, increasing investment in the education and public health sectors and transferring more administrative authority and responsibility to local settlements. The government also agreed to issue an additional MNT50bn ($39m) worth of bonds for camel and sheep wool producers to support the wool industry, as well as MNT150bn ($117m) in bonds to help small and medium-sized businesses. The projected mining wealth has also seen growth spread throughout the economy and into the banking sector. 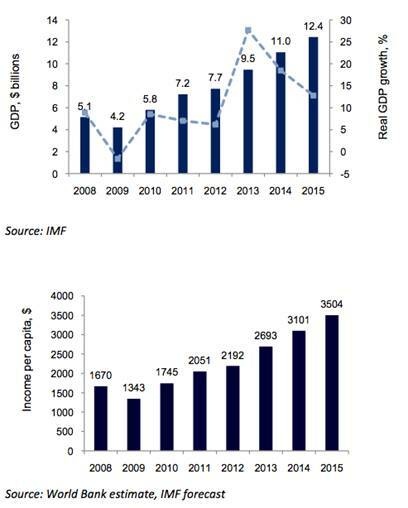 In the first 10 months of 2011, government revenues rose to MNT3.47trn ($2.64bn), while total expenditure and net lending amounted to MNT3.29trn ($2.5bn), creating a surplus of MNT189.7bn ($144.17m). Foreign trade surged by 90% year-on-year (y-o-y), reaching a value of $4.33bn. Tax revenues grew to MNT964.7bn ($733.17m), a 46.7% y-o-y rise, according to the NSO. Meanwhile, the NSO revealed in November that in the first 11 months of 2011, total industrial output increased by MNT175.4bn ($136m), or 10.4%, to MNT1.86trn ($1.45bn) compared to the same period in 2010. However, this confidence was not reflected in the Mongolian Stock Exchange (MSE) in the latter half of the year, with the MSE Top 20 Index of Mongolia falling 18% from April to December. It is hoped that performance will improve in the coming years in part due to improvements in technology and rules and regulations as part of Batbold's reform plans. Such instability has not been evident in the banking sector, which received a boost in December when international ratings agency Standard & Poor's revised its outlook for a major bank and raised the country's sovereign credit rating as a whole. In September, the government revealed it was studying the models of nations such as Qatar and the UAE with regard to managing resource-related wealth, as well as being advised by 16 global banks. The Central Bank of Mongolia spent much of 2011 trying to ensure the stability of the Mongolian financial system and economy amid the high growth. However, despite the central bank's best efforts — in February, the reserves requirement ratio was increased to 9%, while in April, the policy rate was increased to 11.5% — inflation rose to 10% in September 2011, above the 12-month average of 9%. Factors certain to impact on inflation are employment and wages, with the former showing marked progress in 2011. The government declared 2011 a "year of employment support" and asked businesses to create jobs for the unemployed to increase household income, with ministries revealing in December that 72,080 new full-time and some 45,000 temporary jobs were created in 2011. A month earlier, the government announced plans to increase wages of state workers by an average of 53% in 2012. A major contributor to the addition of jobs has been the country's huge mining projects. An initial public offering (IPO) on the London Stock Exchange of the Erdenes-Tavan Tolgoi coalmine, part of the world's largest deposit of coking coal, is scheduled for 2012 and expected to raise $15bn. There are also important developments in store for the vast copper and gold mine of Oyu Tolgoi in 2012, with its 66% owner – Rio Tinto and Ivanhoe (the rest being held by the state's mining firm) – expecting the Gobi Desert mine's average annual output to be 544.21m kg of copper, 650,000 ounces of gold and 3m ounces of silver in the first 10 years of operation. The vast site employs some 14,000 and is scheduled to begin production in late 2012 or 2013. While observers agree about Mongolia's potential, they also tend to echo the same concerns over the pitfalls of high growth. Memories are still raw of the dire effects of the 2008 financial crisis on the economy, which saw the country turn to the IMF for a $224m loan. Despite the challenges ahead, Mongolia is on steady ground at the moment, with the government aiming to capitalise on its rapid mining growth to diversify and expand other sectors of the economy. Provided it continues to prudently allocate mineral wealth into other promising sectors, Mongolia should be on track to see a growth figure in 2012 that is about as high as 2011's. BEIJING, January 30 (AFP) — Mining in southern Mongolia is threatening the livelihoods of herders and straining water supplies, a report said Monday, as foreign companies race to exploit the country's rich mineral deposits. Mongolia has opened up it vast reserves of natural resources to foreign investors in the hope of pulling thousands out of poverty, but activist groups said herders, townspeople and the environment were paying a heavy price. In 2009, Mongolia sealed a long-awaited multi-billion dollar deal with Canada's Ivanhoe Mines and Anglo-Australian miner Rio Tinto to develop Oyu Tolgoi, one of the world's richest copper deposits and a key gold source. Ulan Bator is also selecting foreign companies to develop the prized Tavan Tolgoi coal deposit, one of the largest on the planet. But the mines, located in the vast Gobi desert, were being developed without sufficient scientific information about the potential environmental and social impact of the operations, activist groups said. "The future of herding in the South Gobi is under threat as the development of extensive mine infrastructure pushes herders out of traditional camps, fragments pasture land and puts pressure on water resources," the report said. The report was published by CEE Bankwatch Network in the Czech Republic, urgewald in Germany, Bank Information Centre in the United States and Oyu Tolgoi Watch in Mongolia, with the financial assistance of the European Union. Towns located near the mines lacked adequate services and infrastructure to handle their burgeoning populations, it said. Increased dust caused by mining and trucks was exacerbating "desertifcation and the decreasing quality of vegetation", as well as fuelling the number of asthma and bronchitis cases in the area. Local residents were also missing out on promised job opportunities, according to the report, which was based on interviews with herders and people living in towns near the mines as well as mining companies and investors. "An influx of people from outside the region increases competition for jobs, and while herding engages both men and women, mining offers more opportunities for men," the report said. January 25 (InfoMongolia.com) Davos city of Switzerland has been hosting the World Economic Forum (WEF) for 41 years where the world political and economic leaders get together in defining the tendencies of geopolitical situation and development. This year the Forum will run from January 25 to January 29, 2012. The Prime Minister of Mongolia S.Batbold was initially scheduled to attend the Forum but because of his duty to form the Cabinet of the Government with no delay, the Minister of Mineral Resources and Energy D.Zorigt headed to the Switzerland today on behalf of Mongolia. During the WEF on East Asia that held in Jakarta, Indonesia last June 2011, the founder of the World Economic Forum and the economist Klaus Martin Schwab met with the Prime Minister S.Batbold and officially invited him to attend the Forum in Davos in 2012 and the two agreed to organize the Mongolian Days in Davos. Accordingly, Mr. Klaus Schwab has ordered 2,500 cashmere set including top, hat and scarf for the world leaders who will be attending the meeting th is year. That was the great news for Mongolians as it would be a huge opportunity for Mongolian agricultural and manufacturing sectors to advertise their products abroad and by doing so it would definitely attract many who are interested in the mining resources of Mongolia toward Mongolian cashmere. January 30 (Wildlife Conservation Society) Wildlife health experts from the Wildlife Conservation Society have published evidence which supports the conclusion that Mongolian gazelles—one of the most populous large land mammals on the planet—are not a reservoir of foot-and-mouth disease (FMD), a highly contagious viral disease that threatens both wildlife and livestock in Asia. Outbreaks of FMD in Mongolia affect domestic sheep, goats, camels, and cattle as well as Mongolian gazelles. In a country where roughly one-third of the human population relies directly on livestock production for their subsistence, outbreaks of FMD cause severe disruption of the rural economy. The study, titled "Serosurveillance for Foot-and-Mouth Disease in Mongolian Gazelles (Procapra gutturosa) and Livestock on the Eastern Steppe of Mongolia," appears in the January edition of the Journal of Wildlife Diseases. The authors include: Sanjaa Bolortsetseg, Shiilegdamba Enkhtuvshin, Wendy Weisman, Amanda Fine, Angela Yang, and Damien Joly of the Wildlife Conservation Society; and D. Nyamsuren of the Dornod Aimag Veterinary Laboratory, Choibalsan, Dornod Province, Mongolia. The Mongolian gazelle is a medium-sized antelope with a heart-shaped patch of white fur on its rump. The species gathers in vast migratory herds across Mongolia's Eastern Steppe, considered the largest intact temperate grassland in the world. The gazelle is under pressure from a variety of threats, particularly exploration for oil, gas, and minerals. The research culminates a decade-long effort to examine the potential role of the gazelles in FMD ecology. In the recently published study (undertaken between 2005-2008), the research team collected blood samples from 36 gazelle calves and 57 adult gazelles in order to determine the prevalence of antibodies to the foot-and-mouth virus (FMDV). The team also collected samples from domestic animals kept in areas frequented by gazelles, including 138 sheep, 140 goats, 139 Bactrian camels, and 138 cattle for comparison. The authors found that the patterns of FMDV antibody prevalence in gazelle populations reflect the dynamics of FMD in livestock across the Eastern Steppe of Mongolia. During 1998-99 (outbreak free years in livestock), researchers detected no antibodies in gazelles; conversely, during a FMD outbreak in livestock in 2001, researchers detected a 67 percent prevalence rate in gazelles. The recently published study examines the following outbreak free periods, during which the team noted a declining prevalence in FMDV antibodies in the gazelle population. Based on these observations, the authors conclude that the Mongolian gazelle population is not a reservoir for FMDV on the Eastern Steppe of Mongolia, but rather, the virus enters the gazelle population after spillover from livestock during sporadic outbreaks. "The successful control of foot-and-mouth disease on the Eastern Steppe will require a program that focuses on livestock populations and entails health monitoring and vaccinations of domestic animals when needed," said WCS veterinary epidemiologist and co-author Shiilegdamba Enkhtuvshin. January 30 (Jon Springer via SeekingApha) I first met Christopher de Gruben while in Mongolia for two weeks in September of 2011. In Mongolia: Why And How To Invest In Real Estate, I profiled him, his real estate firm M.A.D. Investment Solutions, and what was then the Real Estate Mongolia fund he was raising capital for in conjunction with ResCap. Mr. de Gruben will now serve as the CEO of Real Estate Mongolia (R.E.M.) which will be a publicly traded company in Canada and the United States following a model similar to that of Mongolia Growth Group (MNGGF.PK). Real Estate Mongolia is slated to begin trading publicly in the 2nd quarter of 2012 and is currently open to accredited investors investing a minimum of $20,000. R.E.M. will be listed in Canada with a ticker that trades in the U.S. in the same fashion as Mongolia Growth Group, Prophecy Coal (PRPCF.PK), SouthGobi Resources (SGQRF.PK), Erdene Resource Development (ERDCF.PK) and Kincora Copper (BZDLF.PK). These changes to the formation of Real Estate Mongolia - from being an investment fund to being a publicly traded stock - were made after management interacted with prospective investors at road shows from Hong Kong to London. Mr. de Gruben was kind enough to share with me a look at his $1,200 450-plus page report on real estate in Mongolia, and real estate's place in the broader macro-economic picture of Mongolia. After reading through all his data, I wanted to ask some questions to share his perspective with readers interested in investing in Mongolia. Any reader interested in investing in Mongolia can benefit from the wealth of knowledge Mr. de Gruben has accrued since coming to work in Mongolia in 2005 and founding M.A.D. Investment Solutions in 2009. 1 - Someone comes to a presentation for the Real Estate Mongolia, stands up, and says, "I have one million dollars to invest in real estate in Mongolia. I could invest it with Alisher Ali's Mongolian Development Resources on the Mongolian Stock Exchange and get the benefit of his wide range of investing experience in Mongolia and Central Asia, I could invest it with Lee Cashell's Asia Pacific Investment Partners and get the benefits of an IPO listing on the Hong Kong stock exchange and the biggest land bank in Mongolia, I could invest it with Harris Kupperman's Mongolia Growth Group that already has a track record of stock exchange performance and his track record as a hedge fund manager, or I could invest with your company. I only want to invest in one. Mongolia Growth Group closed their last offering in December, but its share price is near its last private offering price. Asia Pacific Investment Partners is trying to raise capital currently, as is your Real Estate Mongolia Fund. Your company is the only one that ostensibly has no property in it yet. Why your company?" Your answer? Mr. de Gruben: I would like to start by saying that I believe that all of the above are excellent investment vehicles to make the most of the Mongolian Real Estate Market opportunities and that each has a different offering and targets slightly different investors, but they all provide a good level of exposure to Mongolia. Let me clarify a little bit the main differences I see between R.E.M. and the above investment vehicles. Alisher's Mongolia Development Resources [MDR] is indeed listed on the Mongolian Stock Exchange [MSE] but I believe that this in itself restricts its current potential. The MSE currently has a very low trading volume and practically no liquidity. As a result of this, amongst other factors, MDR has not been doing very well over the past few months, its stock lacks international exposure and does not benefit from the credibility that comes with the stricter regulatory regulations of other exchanges. MDR is further engaged in what I consider to be currently a niche market, from what I understand they invest primarily in infrastructure projects, which are by their very PPP nature (public-private partnership), notoriously complicated to bring to fruition, mostly thanks to government involvement and endemic corruption. It is never the less a no-brainer that once MDR really cracks the infrastructure niche it will do extremely well, Mongolia's future will depend on massive infrastructure projects and MDR will be well placed to make the most of that opportunity. Lee's APIP is indeed a great investment vehicle and I know too little about it to really discuss its merit but would just like to specify that APIP does not owns the largest land-bank in Mongolia, just one of the largest currently open to investors. I know of a number of companies in Mongolia such as Newcom, Max, MCS, Bodi, etc. that have far greater land-banks as well as some wealthy individuals that own sizeable properties all over Ulaanbaatar and other Mongolian secondary cities. Having said this, there is no doubt that Lee's land-bank is probably one of the most desirable in UB. My slight worry with investments in APIP is based on the current construction risks it carries, the supply of labour, construction materials and financing as well as constraint on weather means that construction is a difficult industry at the moment in UB. Being focused on large construction projects that lock up capital for 3 to 5 years also means that investors are more likely to miss out on other exciting opportunities that are possibly more liquid in such a dynamic and fast changing market. I also see potential conflict of interests / lack of transparency inherent in such a vertically integrated company; In addition to the risks of price fixing, etc., Mongolia is relatively unique in that it is extremely hard to source qualified labour and we ourselves tend to stay away from labour intensive industries simply because the talented manual labour simply does not exist or its cost is too prohibitive to be economically worthwhile, the same is true of experienced management which is extremely hard to source and retain. 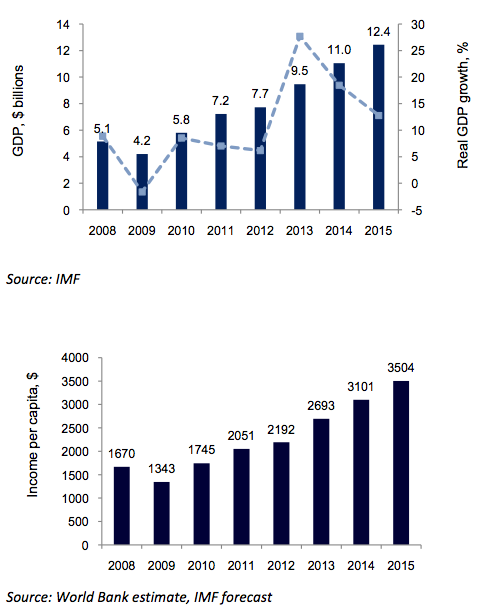 Mongolia Growth Group is by far our closest competitor in terms of structure and targets. They have done extremely well in the past year and we have continuously worked in tandem with them on a number of projects. Today's structure of R.E.M. is actually entirely based on theMGG model, we have played with a great number of different structures and came to the conclusion that MGG had the right mix of ingredients to make it as efficient as possible. MGG is currently limiting its investment scope to Ulaanbaatar and its retail properties, something which is understandable as Harris does not yet have the experience or management man-power to go into secondary cities and other asset sectors are often fraught with dangers of oversupply or lack of liquidity. MGG has also branched out into other ventures such as insurance (a necessary step to insure their own portfolio as no other reliable insurers are currently in the market place). I know that Harris is always on the look-out for new opportunities further afield and I am convinced that R.E.M and MGG will end up co-operating on a number of projects across Mongolia where we bring in complementary skill sets. While it is true that in terms of capital raising, we will be competing with MGG, with regards to investments on the ground, we consider them as a key partner rather than a competitor. 1) All of M.A.D. Investment Solutions Real Estate Portfolio of an estimated 2.5 Million USD of assets, including high yielding residential properties in Ulaanbaatar as well as land and commercial assets in the South Gobi will be injected into the company, this will essentially form our qualifying transaction. 2) In addition to this, all of M.A.D. 's operations and their revenues will be injected into the company, this is substantial as we are probably one of the firm's in UB with the widest range of real estate services dedicated to foreign investments into this sector. R.E.M. 's operations will of course take priority but maintaining all other operations drives liquidity for R.E.M., brings about opportunities and operational synchronicities as well as contribute revenues and on-the ground expertise to R.E.M. Research Squared (our dedicated research company) and its considerable intellectual property will also be injected into R.E.M. 3) M.A.D. is also the only real estate company in Mongolia to maintain its own dedicated and independent research department on the Real Estate market of Mongolia. This means that today we work with all the largest players that require intelligence on the market, we can includeCBRE, Knight Frank and Jones Lang Lasalle amongst our clients. With a number of tailor made solutions (due diligence, site visits, desktop valuations, business planning, market intelligence, etc.) as well as the publication of the ONLY comprehensive Real Estate Report we have incredible access to market information that no one else has. Just to go back over the report, it is 450 pages of in-depth analysis of all sectors of the market, it is an incredible undertaking and has taken a team of 9 people 10 months to compile, nearly all from primary research. It is truly a "bible" for any prospective real estate investors in Mongolia. 4) The unique and unparalleled experience of our executive team and its network. We benefit from having perhaps some of the best Mongolian and expat Real Estate specialists in our team. I have myself been working in Mongolia's Real Estate industry for the past 7 years but altogether we amount to an incredible level of on-the-ground expertise that translates into the successful operation that is M.A.D. Investment Solutions, as well as its property report. We have participated in over a 1,000 combined Real Estate transactions across all asset classes, throughout the country and of all sizes. With a continuously growing database of over 6,000 recorded proven transactions, we have a real take on the pulse of the city and country. This level of expertise and market knowledge is not yet matched by any of our competitors as can be demonstrated by the publication of our 2012 Property Report. 5) We have an excellent track record of investing across all areas and asset classes within Mongolia. This means that from day one, R.E.M. will own assets in the South Gobi as well as Ulaanbaatar but will be able to target assets as far afield as BayanUlgii, Kvod and Sainshand. I would also like to point out that R.E.M. will take over M.A.D. 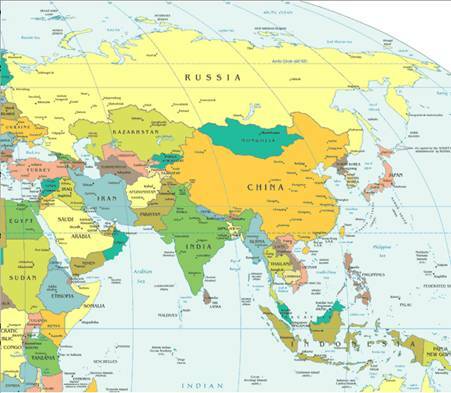 's offices both in Ulaanbaatar and in the South Gobi (Dalanzadgad). 6) We have a truly wonderful capacity and flexibility to source what we believe to be the best opportunities and sectors of the moment, we are not tied to a single project or sector. Mongolia is an extremely fast moving and dynamic market where each year is markedly different to the last. We need to remain flexible and liquid enough to make the most of the current opportunities. This is why for instance we will only invest in late stage construction projects and never in their early stages. The construction risk in Mongolia is too high and the duration of the projects too long for the investment to be worthwhile, we much rather bridge-finance the completion of distressed assets. 2 - Is it a coincidence that Asia Pacific Investment Partners, Mongolia Growth Group and the Real Estate Mongolia Fund are all trying to raise capital to invest in the Mongolia real estate market at the same time? If not, why is there this perfect storm of raising capital to deploy into the real estate market in Mongolia? Mr. de Gruben: No absolutely not, the Mongolian Real Estate market is maturing very fast, APIP, MGG and R.E.M. are the first in a long line of institutional investment vehicles that will increasingly look to invest in this high-growth sector. This is a normal evolution of the market that every country has gone through, Mongolia just tends to move faster than others at the moment. There is of course an inherent caveat linked to this phenomenon as there is little doubt that all parties will manage to raise capital and deploy it in Mongolia but as those amounts become increasingly large, we will increasingly start competing against each other for the same targets within Mongolia. I cannot overstate the fact that Mongolia is a tiny market. We are currently in a situation where foreign institutional investments will likely contribute greatly to inflation in the market, certainly in the city centre. It will be a case of first come first serve. There is not much room for other institutional investors to invest without severely impacting the market unless they invest in truly diversified assets. 3 - If China's economic growth levels off, can there still be a boom in Mongolia? Mr. de Gruben: Yes, absolutely and for a number of reasons. First of all, Mongolia is guaranteed a GDP growth of about 7% regardless of the state of China's economy. This is simply due to the amounts of committed capital to the mines currently under development. Oyu Tolgoi, the Ivanhoe (IVN) - Rio Tinto (RIO) - Mongolian government copper-gold mine, is by itself a nearly 6 Billion USD committed capital investment, (equivalent to the Mongolian GDP). OT cannot afford to halt investments as each day they are not extracting costs their operations millions. Secondly, China is and will remain a massive economy with over a billion inhabitants. Regardless of the state of its economy, it will keep producing goods for its domestic consumption (which is the stated priority of the current 5-year plan of the party - developing domestic consumption) and will thus still require massive amounts of resources. What I believe might happen is that as Mongolia starts extracting, it might reduce its imports from far flung destinations such as South America, Africa and Australia and purchase instead from neighbouring Mongolia which is cheaper and already connected to its rail infrastructure. Bear in mind that today Mongolia exports very little of its minerals as the majority of mines are under development and the infrastructure is not yet in place to export en-masse. 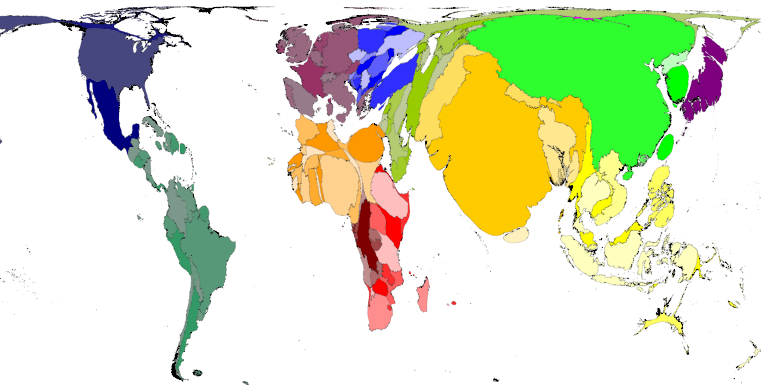 "Ecological footprint" map. This map shows countries proportionally by, "the consumption of food, fuel, wood, and fibers. Pollution, such as carbon dioxide emissions, is also counted as part of the footprint." China's population is more than 4 times that of the U.S., yet the two countries are near parity on this map. Source: Worldmapper.org Ecological Footprint. It is certain that China's decline (if such a thing were to happen) or rather lower growth rates, will impact Mongolia but I don't feel that it would be severe enough to prevent the upcoming boom. 4 - There is a lot of construction going on for office space, hotel rooms, and luxury apartments. 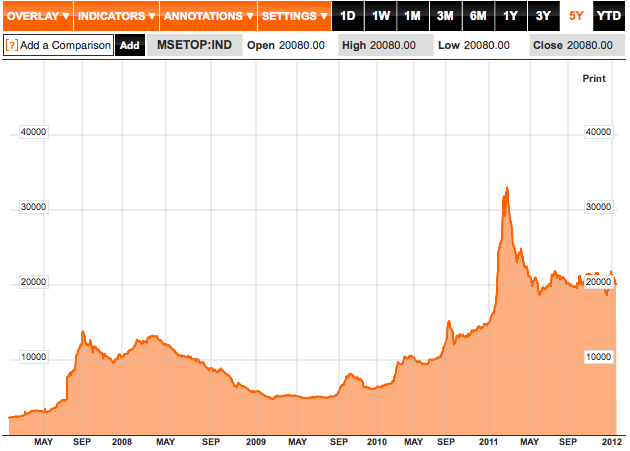 Do you see there being any risk of over-supply in Mongolia? in 3 years? in 5 years? in 10 years? Mr. de Gruben: Absolutely. This is possibly one of the major challenges we have identified for institutional investors. 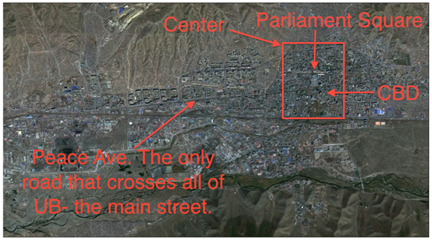 It is hard to comprehend the small scale of Ulaanbaatar unless you have witnessed it from the air or walked its streets. UB is a geographically small city, initially built to support about 350,000 people which today houses 1.2 million people, 700,000 of which live in the ger district. Bear in mind that there are only about 116,000 residential units in the whole city with a new supply of between 6,000 and 8,000 a year. This is minuscule by any standard. 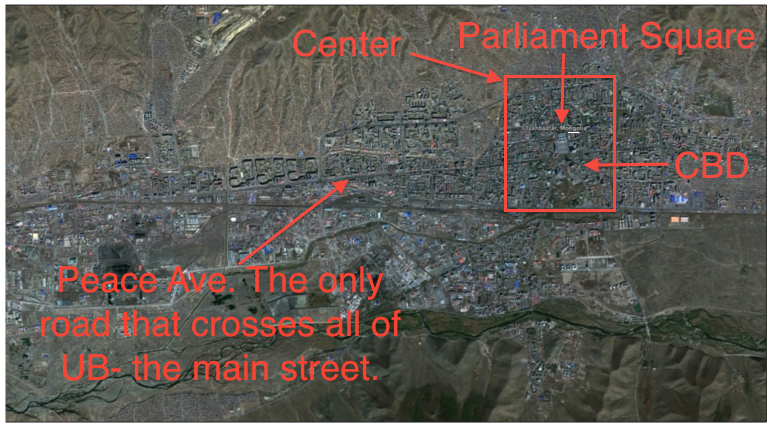 Satellite view of Ulan Bator from The Mongolia Real Estate Report 2012 Executive Summary. Notes on the map are by the author/interviewer. Most shopping areas are located along Peace Avenue and near the center. Most public services are near the center as well. For perspective on traffic, it took the author one hour to go from 6 miles (10 km) out of the center into the center on Peace Avenue in the middle of the day in September 2011. I see development in Ulaanbaatar coming in waves, a few year ago we had a frantic wave of Grade A and Grade B office space construction with the predictable result that with over 100,000 square meters of office space coming online in 2009 and 2010 we saw a massive oversupply with 3 entire buildings still standing empty in early 2011. In the summer 2011, the boom in the economy contributed to enormous capital growth in the real estate market which has gradually led to an absorption of the oversupply of office space to the point that demand far outstrips supply today. The next sector of the industry to be hit by this temporary oversupply, will, in my opinion be the hotel sector. There are currently 6 international chain hotels in construction within Ulaanbaatar with an estimated 2,500 mid to high end rooms. This is massive for a country that only has an average of 2 international flights a day coming in. Those rooms are coming in addition to the existing hotels, how long will it take for demand to fill up all of this new supply? This will only happen once we see real growth in transportation in the country and domestic infrastructure, probably in 3 to 5 years. The same is true again of shopping malls, the majority of the new larger shopping malls in UB currently have 30 to 40% vacancy but this is not to say that the demand does not exist for something that is well designed, has ample heated garage space and is well located. In my opinion this is more a case of the supply failing to meeting the needs of the demand or rather aiming itself a future demand. Looking towards the future, I see that some sectors of the market still have considerable demand and growth for a number of years while others are heading towards real oversupply. Mid-cost housing is an enormous growth area, so is retail. There also are a number of products, in particular leisure and entertainment products as well as parking garages which do not exist yet which are desperately needed. This topic is discussed in great detail in our Mongolian Real Estate Report 2012. 5 - Mortgages are used for less than 10% of real estate purchases in Mongolia currently, right? Do you see that number rising? Do you foresee Mongolian culture embracing the idea of using mortgages to purchase homes? Do you think an expanding mortgage market will push up real estate prices? With current government interest rates at 12.25%, how can mortgage rates get low enough to be attractive to a larger number of people purchasing real estate? Mr. de Gruben: Yes, it is correct that it is estimated that today only 9% of the secondary real estate sector and 20% of the primary markets are mortgaged as a whole. I absolutely see that number rising over the next few years, and actually I consider this as one of the main drivers in the market over the coming 5 years. Mongolians seem all too happy to embrace mortgages and have already done so to a certain extent. Before domestic banks can really start offering attractive mortgages a few elements would need to come into place first. First of all it is important that the banks increase their own liquidity and have greater access or exposure to foreign sources of financing, this will happen naturally over the next few years as better procedures are put in place, banks become more established and the economy grows. Beyond that, there is a clear need to amend the laws to streamline Bank repossessions and carry out foreclosures, today it is too complicated and lengthy, adding to the reluctance of banks to offer complicated mortgages while they could instead concentrate on more profitable and easier corporate financing operations. Having said this, I would point out that mortgage rates have actually come down considerably in the last few years, when i first arrived in Mongolia (7 years ago), advertised rates were at 20% minimum and the term was rarely longer than 3 years, now we have mortgages at 15% with terms of up to 10 years so things are clearly slowly improving. I expect that within 5 years, rates will have dropped to 6% or 7% but the shorter term improvements are likely to come from developers working directly with the banks to offer financing options to buyers in their developments, for instance MCS group has inked an agreement with Khan Bank with the result that now over 25% of the sales in their new development (Shin Ger) are leveraged. The Mongolian Government has also realised the vital importance of mortgages to better distribute wealth and is pushing banks to offer mortgages in the new '100,000 homes' project at 8%. Means-tested 8% mortgages are already on offer to a few low-income families, although application of this program is not very widespread. There are talks of a new 6% mortgage, but this is some way off. 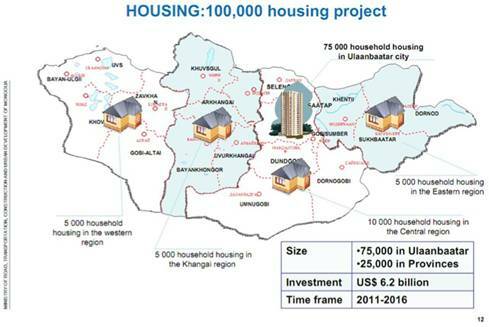 The 100,000 project calls for 75,000 new domiciles in Ulan Bator by 2016. Source: Frontier Securities; Ministry of Road, Transportation, Construction and Urban Development of Mongolia. It is essential that mortgage rates come down in the short to medium term to allow for a much larger portion of the population to take part in the growth of the real estate market of Ulaanbaatar and push forward the development of the industry, in itself essential to the development of the economy. Today, only a very small percentage of the urban population has the means to purchase property in what is essentially a cash-only system. The development of a mortgage market will allow for that young, dynamic population with increasing disposable income to leave their current multi-generational family unit and move towards a more nuclear set up as well as build up capital reserves in the form of home equity. 6 - How do you anticipate the mining boom in far off regions of the country impacting the real estate market in Ulan Bator? Mr. de Gruben: The anticipated mining boom is the single biggest ingredient in the growth of the economy and therefore the real estate market. It is having a massive impact on all sectors and it is of course all interlinked. Within Ulaanbaatar we see this impact in a number of forms. First of all (and possibly least important) are the vast quantities of expats (4,000 to 6,000) that are coming to work in the mining industry and its supply chain and are renting mid-to-high end apartments within UB, they form the majority of the rental market in Ulaanbaatar and companies such as Oyu Tolgoi are driving up prices as they have very generous housing allocations. Increasing supply of acceptable accommodation to expats will likely drive down prices while a number of expats who are here for the construction phase of the mines will be leaving in the next couple of years. The other impact that we are seeing from the mining boom is in the warehouse and office sectors; all the mining and mining supply chain companies need offices and warehouses in Ulaanbaatar and this has massively driven up demand in those sectors for the past couple of years. 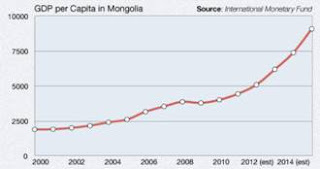 Source: ACI Mongolia; The Financial Markets Association; Mongolia Growth Group November 2011 presentation. 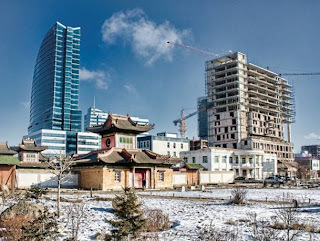 The most noticeable impact that the mining boom has had on the Ulaanbaatar real estate market can really be seen in the distribution of wealth this has generated. We have seen so many new families with new disposable income looking to buy new property either to live in or as investments. 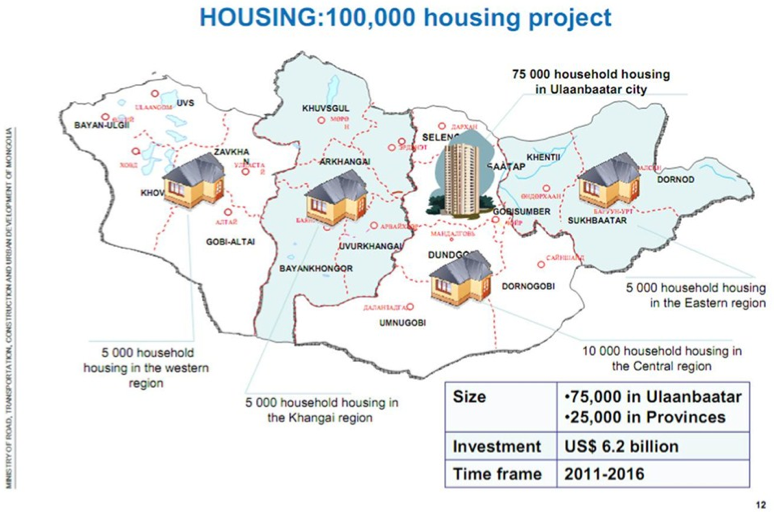 7 - The 2020 Master Plan for Ulan Bator wants to move people out of the sprawling ger districts (informal housing areas often lacking utilities) into more central apartments. Is the city planning to develop more vertically? Mr. de Gruben: In accordance with the 2020 Master Plan a 'compact city' model has been put forward as the preferred future for Ulaanbaatar's development. This involves a two-fold expansion, vertically in the heart of the city and suburbs, as well as horizontally, out to new and expanded satellite towns. As an example, the entire campus of the National University of Mongolia is to be moved to a dedicated campus town outside of the city centre. There are, however, significant restrictions already on the potential expansion of the built environment of Ulaanbaatar. Joint power and heating stations are nearing generating capacity and presently supply only the inner portion of the city. Sewage and water supplies are also woefully inadequate to cope with expansion of the built environment, supplying an inner ring that reaches less than half of the city's present population. This means that the ger districts are likely to remain a feature so long as in-migration continues to outstrip efforts to expand infrastructure (such as the construction of a new power station to the east of the city, expected by 2017 - which by the by is a replacement for the existing capacity and not an addition). Another factor in limiting the movement of people from ger districts to formal housing is the recent land privatisation program that enabled every Mongolian family, and later, each citizen, to gain possession of a piece of land in the city of up to 0.7 hectares for just a small administrative fee. Almost all plots made available for privatisation in Ulaanbaatar since 2008 have been taken up, meaning many ger district families basically own the land upon which their ger or informal housing unit is situated. In order to redevelop these areas the City Government has been working to buy back plots but are now forced to pay market prices for this land or face stiff opposition from residents, who are themselves reluctant to move as many run small informal businesses from their plot of land - a critical source of income for the poorest segment of Mongolian society. These factors combine to create a situation where the Master Plan's vision of relocating people from the ger districts to apartments or satellite towns faces significant obstacles. This will keep demand for a limited apartment stock high in the short to medium term, creating conditions for sustained growth in value. The city itself has undoubtedly begun to develop along a vertical trajectory and will continue this trend, albeit at a more manageable pace than the 2020 Master Plan projects. I would further point out that in the 7 years I have been in Mongolia, the master plans have been transformed in many ways according to the wishes of the political masters but very few elements of it are actually been translated into buildings on the ground. I give little credence to those Master Plans at this time but hope that this will change and that such projects are followed more rigorously. 8 - Zoning and planning seem to be major problems. Housing developments are built without thought of where people will go to schools, hospitals, or shops. Will this get better under the 2020 Master Plan? Do you see the development of services reaching areas further out from city centers or more pressure on people to live closer to the center due to a lack of services away from the centers? What other factors pressure the real estate market particularly in Mongolia's capital Ulan Bator? Mr. de Gruben: Services, and the lack thereof, are of significant concern to urban planners in Mongolia. Immediately following the 'transition' of 1991 the Government of Mongolia lacked sufficient funds to commission a study and implement a new 20 year plan. This led to real estate development following short term goals rather than attending to long-term housing and infrastructural solutions. The Master Plan 2020 outlined far-reaching alterations to the city's infrastructural core. Favouring a compact development model, the Master Plan sought to move households in from the ger districts surrounding Ulaanbaatar, thereby maximising access to existing infrastructure and reducing the need for costly and complex extensions to heating, water, sewerage and electricity supplies. This strategy would ultimately reduce running costs as well as minimise environmental burden. Unfortunately the present trend seems to be moving away from this projection. The Government's land privatisation program in the ger districts has seen households and individuals being given large plots of up to 0.7 hectares each for a nominal administrative fee. This has led to the sprawling and rather haphazard organisation of the ger areas of the city becoming fixed by the structures of private ownership. Many residents of more established ger areas, near to the city centre, are not overly keen on the idea of giving up their land and moving to an apartment, stating instead that they prefer to wait until infrastructure is extended to them. Many are making this intent clear by developing informal brick housing on their land which they live in during the summer months (during the winter months a ger is easier and less expensive to heat so most ger district households move to their gers during this period). Whilst the city centre will undoubtedly undergo densification it seems inevitable that neighbourhoods will remain on the sites of the current ger districts for some time to come and that, short of enacting compulsory purchase, city planners will have do find creative ways of providing services to these sprawling communities. In terms of other, albeit related, factors pressuring the real estate market in Ulaanbaatar, there are two driving forces. The first is the availability of infrastructure. As already noted, electricity generation and heat generation available to the city from it's power stations are nearing capacity already due to increased construction and use of electrical household goods. Medical facilities are presently woefully inadequate and scattered, whilst schooling and kindergarten facilities need to be developed to cater for population growth via in- migration. This last point - migration - is a further driver to the market. In 2011 alone the population of Uaanbaatar grew by over 40,000 people (net in-migration), an increase amounting to over 3% of the existing total population of the city in one year. As economic migration continues to be a factor in drawing people both to the capital and now, increasingly, to the Gobi region (in search of high wages in the mining industry), migration will play a large role nationally in driving up demand for real estate. 9 - Property taxes in Mongolia are very low. Why is that? Do you think they will stay that way? Mr. de Gruben: The taxation environment for property in Mongolia has received reasonable little sustained political and policy attention since private ownership was legislated for in 1994. Technically sale of property only attracts a 2% income tax, payable by the seller. Ownership taxes are presently 0.6% on commercial or rental property (any property earning income for the owner), although this will rise, on a sliding scale, from 0.6% - 1% come 2013. With so much attention given over to mining and the development of an appropriate taxation environment for this strategic industry, property tax has been left on the back-burner. Of course, in a property market just over two decades old, low taxes help spur market growth and sustain liquidity, as home owners can liquidate their assets without heavy tax costs. As wealth in the country increases and lower cost mortgages become more available, it is likely that property taxes will begin a slow rise. There are presently no plans to increase the income tax on property from its base of 2% but the policy environment in Mongolia is prone to quick changes, although in the near future it seems unlikely that the Government would wish to hinder market development by imposing a stricter tax regime. 10 - Under communism from 1921 to 1991, the Soviet influence on Mongolia was significant. My understanding is that there were more regional centers, including small health clinics, schools, and other regionalized services, throughout the country under the influence of communism and the Soviets, and that as things were rationalized after 1991, there has been a consolidation of services to city centers that has impacted the society. I believe this impacts Mongolia's capital Ulan Bator as well as provincial capitals such as Dalanzadgad, the nearest provincial capital to the Oyu Tolgoi and Tavan Tolgoi mines. Can you elaborate on the historical changes in society after communism, as well as how population migration is impacting the society and real estate prices? Mr. de Gruben: As noted above, migration is a major driving factor in Mongolian economic development. The real estate market both benefits from this and is a necessary precursor thereof. Labour mobility relies on the capacity of a workforce to access housing near to where jobs are available and the capacity to buy and sell property in a free-market, without incurring significant capital costs, make this possible. In 1989 68% of Mongolia's population lived in the vast rural areas of the nation. As of 2010 68% are considered to be urbanised. Ulaanbaatar has typically been the focal point of this urbanisation trend, with a population of 1,240,000 in 2010, up from just 760,000 10 years ago. This continues a trend of movement towards the city which began in the mid twentieth century with the development of industrial infrastructure in Ulaanbaatar. Even during the socialist period migration to the capital routinely outstripped the projections of urban planners. As already discussed, this has led to sprawl and densification of the capital's ger districts, as well as excess pressure on social and infrastructural services. Now, however, the booming mining industry is providing new migratory incentives - shifting focus away from the capital and towards the boom-towns of the Gobi region (including Dalanzadgad and Khanbogd, where average wages rose up to a third faster than in the capital in 2011). This is taking migratory pressures off of the capital to some extent, although these Gobi towns are now seeking significant investment in order to cope with populations that are expected to double every few years a mining operations such as the huge Oyu Tolgoi come online and begin to employ more local staff. UB is the capital city of Ulan Bator (or Ulaanbaatar). The area south of UB that has seen recent population growth is a representation of the Gobi area where many mines are found. Source: Frontier Securities; Ministry of Road, Transportation, Construction and Urban Development of Mongolia. In terms of service provision, reigning back of the social safety net provided by the socialist Government has meant that people are finding it increasingly difficult to access schooling, medical facilities and other basic social services, particularly in rural areas. Lack of investment has left services crippled and staffing levels inadequate to serve a dispersed, rural population. One case and point is the hospital in Dalanzadgad, which serves the entire Aimag of Umnugobi with a handful of travelling doctors and outdated operating facilities. Boarding schools which used to operate for rural communities are less well funded, as are the transport services too and from these. This means that children of poor, rural families are less likely to be able to access a good education than they were during the socialist period. Urban infrastructure and social services are also proving inadequate to cater for population growth. In the capital, Ulaanbaatar, ger district residents face significant barriers to social advancement that come from lack of access to basic infrastructure, threats to health from poor sanitation and critical levels of pollution, as well as lack of roads and public transport that further reduce economic opportunities and standards of living. With the far-reaching Master Plan some significant way off completion, organisations such as the Asian Development Bank [ADB] have taken on the challenge of improving facilities in these ares, developing businesses and services around transport hubs in the ger areas of Ulaanbaatar that form de facto local centres. These will therefore form the basis of local economic growth and, it is hoped, therefore lead to expansion of amenities. 11 - What are the comparable valuations you use to evaluate Mongolian real estate prices? Do previous resource booms in Chile, Qatar, Kazakhstan or elsewhere translate to the Mongolian real estate market? Mr. de Gruben: These have all been used as benchmarks for the Mongolian case. Kazakhstan is perhaps the best model, although its boom came from petrochemicals and its banking system was the envy of much of the ex-Soviet bloc. Different structures of ownership of mineral resources make the Qatari case a more difficult one to find true parallels with, although the potentials that come from distribution of mining revenues to a relatively small national population may mean that Mongolia follows a broadly similar route of social development. The Kazakhstan case study is one that offers hope of meteoric market growth in Mongolia, but also provides a sobering warning. Numbers of residential units commissioned in Kazakhstan began a steep climb in 1999, from 1,105,000 per year to 8,103,800 in 2007. Between 2002 and 2006 prices per square meter in the residential market rose from US $250 to an astonishing US$3,600. However, by 2006 over half of the real estate market in Almaty, was an instrument of investment. A rapidly rising GDP became a reason for overzealous speculation in high end areas of the Kazakhstan market. This actually led to a housing shortage as investors had dramatically overestimated internal demand and the purchasing power of Kazakh citizens. By 2007 real estate prices in Kazakhstan started to level off and then to fall. 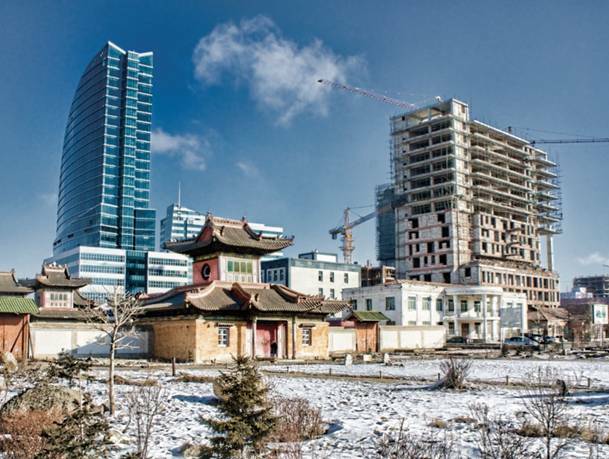 Around 5,000 new apartments were completed in Ulaanbaatar in 2011, well below numbers in Almaty and far beneath the 19,500 required to meet increasing potential demand for that year. Despite rising prices, the market in Mongolia remains majority cash based (only around 9% of the secondary residential market and 20% of the primary residential market is mortgaged at the present time) and so borrowing is not yet a significant risk factor. 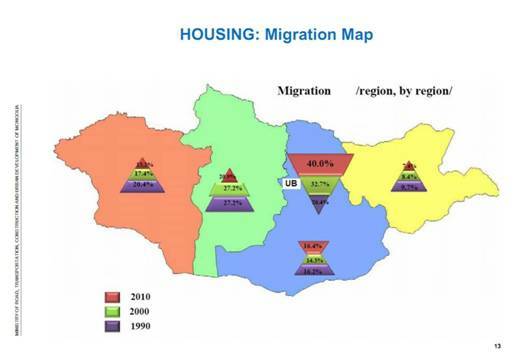 Source: The Mongolia Real Estate Report 2012 Executive Summary. Rapid in-migration, rises in real wages and an economic future secured by significant growth of the mining industry all seem set to secure the future growth of the Mongolian real estate markets. The risk factors which beset Kazakhstan's property market do not appear to be significant factors in the Mongolian market as of yet. 12 - What role will Mongolia's small population size play in its anticipated real estate boom? Mr. de Gruben: The population of Mongolia stood at 2.7 million people in 2010, 44% of which live in the capital, Ulaanbaatar. This relatively small population offers the hope that benefits of the mining boom will be widely distributed in terms of direct payments (as has heretofore been the case), but also in terms of services and social goods. World map drawn to represent proportion of global population in each country. The sliver of bright purple between Russia (light green) and China (bright green) is Mongolia. Source: Worldmapper.org Total Population. The growth of the residential real estate market relies on catering to this small population. 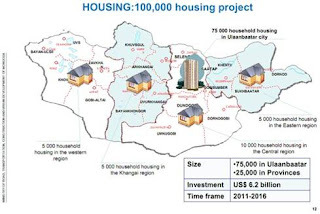 It is expected that within two decades the majority of the population of Mongolia will be living in some form of permanent accommodation, significantly changing a market dynamic which is currently focussing on the development of permanent housing for households who up until this point have lived exclusively in gers. This is, ultimately, a small internal market and one which, as some very large-scale developers have already discovered, has a certain economy of scale. 13 - What role will Mongolia's harsh weather (particularly in winter) play in its anticipated real estate boom? Mr. de Gruben: Mongolia has a very extreme continental climate, ranging from -45 celsius in the wintertime to above +30 during the summer months. Extreme cold sets in from around November and ends in March. The building season is, therefore, relatively short: ranging from April to October. Most construction sites around the city grind steadily to a halt over the winter months, which are entirely inappropriate for pouring concrete or for outdoor construction work. Some well financed construction projects (including the new Shangri-La hotel project in the Central Business District [CBD]) use construction methods that involve encasing the concrete frame of the building and heating the construction site so as to enable year-round construction work. However, this is a prohibitively costly solution. View from behind the CBD in winter. Source: The Mongolia Real Estate Report 2012 Executive Summary. New construction techniques and weather resistant materials are gradually being introduced in order to extend the building season as far as possible. Nevertheless, the construction market will remain highly seasonal for some years to come. Coupled with a lack of materials and shortage of labour power, the short building season means that mid- size construction projects take a minimum of three to four years to complete, whereas they would take 1.5 to 2 elsewhere, as an example I know of some high-end residential buildings that took 6 years to complete. It is not only the construction market that remains highly seasonal in Mongolia. Residential prices also follow a broadly seasonal dynamic. Market liquidity and prices for both rental and purchase typically fall in the wintertime (as do prices for construction materials). This is because households have a traditional preference not to move to a new location during the extremely harsh winter period. This trend is gradually adjusting to reflect year-round demand, although its effects can still be felt, particularly in domestic markets. 14 - Can you describe the dynamics you anticipate of domestic demand vs. foreign demand for real estate in Mongolia as mining companies ramp up production for what is a clear natural resources boom? Mr. de Gruben: This is another case where Kazakhstan's recent history presents a sobering lesson. Property prices across Ulaanbaatar, as well as nationally, shot up in 2011, rising by over 30% in city centre locations. There has been widespread speculation in the Mongolian media that this has been entirely caused by foreign investors speculating on the back of the mining boom. Whilst foreign investment assuredly does account for some of this rise, increasing domestic demand - driven by rising real wages, increasing overall wealth, domestic speculation and a demand-supply curve that is far from convergent, must account for much of this rise. Speculative construction in Kazakhstan was fuelled by rapid GDP growth based around petrochemical prices. Numbers of houses commissioned began a steep climb in 1999, from 1,105,000 per year to 8,103,800 in 2007. Between 2002 and 2006 prices per square meter in the residential market rose from US$250 to an astonishing US$3,600. 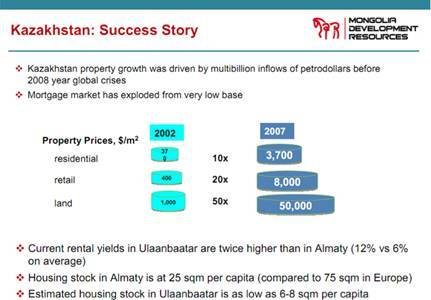 Nevertheless, by 2006 over half of the real estate market in Almaty, was an instrument of investment. This actually led to a housing shortage as investors had dramatically overestimated internal demand and the purchasing power of Kazakh citizens. By 2007 the foreign debt of Kazakh banks stood at over US$ 40 billion, the majority of which had gone straight to financing real estate development rather than development of long-term housing financing. As the real estate market there flattened out in 2007 and then started to contract prices fell. Source: Frontier Securities: "From Cement To Real Estate Agent" report; Mongolia Development Resources. As Mongolia's economic growth continues, underwritten by the natural resources boom, we are already seeing similar growth trajectories in the residential market in Ulaanbaatar. Levels of mortgage borrowing and lending for investment in construction are, as yet, nowhere near those seen in Kazakhstan. The Mongolian banking system remains almost nascent in its development and interest rates on mortgages and loans remain between 15% and 19% on average. Nevertheless, with price growth reaching above 30% in 2011 in some residential sectors we are seeing price rises broadly keeping up with the pace of economic growth in Mongolia. Rising real wages, the increased availability of mortgages, investment of mining dividends in social goods (thereby reducing costs of living and economic threats), mass labour migration and an urbanisation rate well above that of China (on par with Italy) indicate that the economic transformation of Mongolia, as a result of mining, will underpin property sector growth for some time to come. One sector which is seeing significant benefits from the mining boom already is the expat rental market. This represents the higher end of the rentals market, catering for persons with housing budgets typically between US$1,000 and US$7,000 per month. As mining operations such as Tavan Tolgoi and Oyu Tolgoi prepare to come online mining experts and engineers from across the globe are arriving in Mongolia, oftentimes with their families. These new residents seek out well appointed accommodations decorated to western tastes. On the back of mining growth, the financial service sector has also grown apace. Even when Oyu Tolgoi comes online and transfers much of its staffing requirements away from international experts and to local labour, the burgeoning financial services industry will continue to require more and more international expertise. This will keep levels of expat renters high and increase demand for luxury city centre apartments as well as serviced apartments and high-end hotels. 15 - If Mongolia's GDP triples by 2020 (which is widely expected), will the value of property triple, or do you expect a greater or lesser effect of economic growth on the real estate market? Mr. de Gruben: The conditions within Mongolia that presently determine demand and supply make the expectation that property prices will triple by 2020 not unrealistic at all. Across the board residential prices saw a 26.2% rise from 2010-2011 (Q4), with city upper-end purchase prices in the heart of Ulaanbaatar's CBD peaking above 40%. In Q3 2011 square meter prices averaged at US$1,420 per square meter and in Q1 of 2012 their averages are hovering around the US$1,500 per square meter mark, with mid-upper and high-end residential prices hovering around the US$2,200 per square meter mark. What is most remarkable about this growth is that it has largely taken place without significant access to mortgage financing. Only around 9% of the secondary market and 20% of the primary market in Ulaanbaatar is presently mortgaged, with most transactions taking place in cash. Date of source: ResCap's Mongolia 101 Report of January 2011. With in-migration to the capital and to mining centres around the Gobi region continuing, demand looks set to increase. Coupled with rising real wages and and a rapidly developing banking system, which is gradually offering more affordable mortgage financing, the conditions seem set for growth of the real estate market as more and more households gain access to the funds necessary to purchase housing for the first time and middle-class Mongolians place demand on developers for high-quality housing. With the current dwindling levels of supply and the enormous upsurge in demand, it is also possible that property prices far exceeds that 3x multiplicator you suggest and may even rise 5 to 10 fold, if only for a short term. 16 - What else is particular to the Mongolian real estate market? Mr. de Gruben: Private ownership of land has a very limited history in Mongolia. During the socialist period almost all land and property was state owned. Prior to this land was rarely portioned off for private ownership. Just over 20 years after the beginning of transition from socialism to capitalism, Mongolia still operates a stratified system of land rights. While almost all residential immovable property in the country was privatised by 2004, land remained state owned. Only recently have Mongolian households (and now individual citizens), been able to effectively privatise land plots of up to 0.7 hectares in the city centre [.7 hectares = approximately 75,000 square feet or 7,000 square meters]. Foreign citizens and companies cannot own land in Mongolia, although foreign companies and foreign invested companies can apply for possession rights over land, which in, in effect, a leasehold of the land for purposes of implementing specific improvement projects (building on that land). Once construction is complete the building is secured by an Immovable Property Certificate and the land can be left to revert back to State ownership; the building itself is secured by law against expropriation or any similar interference with ownership rights. 17 - Investing in Mongolia, is real estate a superior investment to investing in the Mongolian Stock Exchange, or should investors be exposed to both? Mr. de Gruben: In 2010 the Mongolian Stock Exchange (MSE) experienced an astonishing run up of 121%, a truly exceptional performance for an exchange which only operates for 2 hours a day and at that time had a daily trade volume of a little over US$50,000 per day. The end of 2011 saw less spectacular growth but having signed a management agreement with the London Stock Exchange, the MSE is set to go from strength to strength. Real estate investments in Mongolia come with a very different set of risk factors and advantages. The first of these is speed of transaction. Low transaction volume in the MSE makes getting even US$100,000 into play a protracted process. 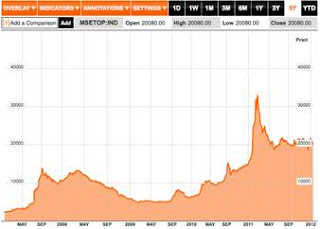 Mongolia Stock Exchange 5 year chart as of January 13, 2012. Source:Bloomberg. By contrast, real estate transactions can be concluded within a day and frequently are. The oldest apartments in Ulaanbaatar city centre (known locally as the First 40,000 apartments) saw price increases of over 30% during 2011. During the last quarter of 2011 this growth actually outstripped the MSE. Furthermore, income generation potential of property makes it a favoured investment for many. Rising purchase prices have been met with similar rises in rental prices in recent years and the yield on a mid-upper or high-end apartment may be between 10% - 13% on average at present. These returns remain extremely attractive. The risk profiles of each investment strategy are, of course, somewhat different. Bricks and mortar investments are very well protected under Mongolian law and foreign owners maintain exactly the same rights as Mongolian citizens over their real estate investments (although foreign citizens and companies cannot own land in Mongolia). In summing up the differences between real estate and securities investments in Mongolia it would haveto be said that, in our experience, real estate offers more sustained and stable growth, if not for the meteoric rises that the MSE has seen in recent years. Of course, there are a number of ways of gaining exposure to the Mongolian real estate market through investing in listed companies and R.E.M. will very soon be one vehicle by which to gain such exposure. We recommend to our clients to invest their rental proceeds into MSE accounts with ResCap as it may provide exciting additional returns but I would not invest the majority of my capital there. Personally, I feel that investing in Real Estate gives you a much better chance to add value to your investment, you may redecorate, renovate, rent out yourself, advertise etc... while in the MSE you are simply at the mercy of the markets that may go up in the same way as they may go down. The lack of liquidity, the low volume and the high volatility of the market makes it a limited investment opportunity for our investors. I would further point out that while we have seen growth in the market and believe that it will keep growing over the coming years, it is dependent on new IPO's entering the market (which they might not do if there is no capital there) but is mostly dependent on changes in the legislation (as a current letter by Bill Gorman, head of the London Stock Exchange Operation in Mongolia clearly stated). Mongolia has a short window of opportunity to develop its exchange into something credible and worthwhile but political bickering may well put an end to such ambitions. Too much uncertainty and lack of contribution on my part for me to put substantial sums into it. 18 - Why are you living in a city that is one of the most polluted cities in the world and has long winters with temperatures that dip to -40 (the one temperature that is the same in Fahrenheit and Celsius)? Mr. de Gruben: Those who know me well are always surprised that I moved to Mongolia, I adore good food, in particular seafood, enjoy being close to the sea and would love nothing more than being in a warm year-round climate. Mongolia has sadly none of those. 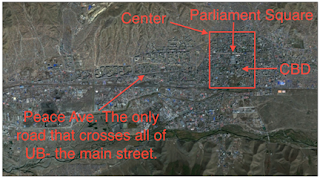 Photo of a ger district in Ulaanbaatar. 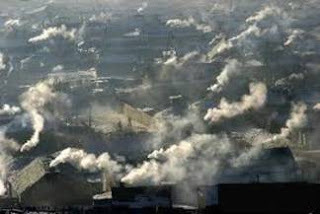 Source: News.mn article, WHO: Air pollutions kills 1,600 people in Ulaanbaatar annually. I am in Mongolia very simply for the opportunities presented by the economic growth of the country. To my knowledge, there is no other country on earth that presents the same mix of unique ingredients that makes Mongolia so exciting, it has a comparatively stable democratic system, is sandwiched between two enormous buyers of mineral resources - something it has in abundance - and I can invest in Mongolia as a foreign investor without restrictions of any kind. It is is certain that Ulaanbaatar is extremely polluted and does not provide for the best quality of life but among my friends from university, I know of none other that has the opportunities that I have today to truly achieve something extraordinary and be part of the development of such an exciting country as Mongolia. 19 - How did you come to be in Mongolia? Mr. de Gruben: My parents were diplomats specialising in the Soviet Union so I have spent the majority of my childhood in the Soviet Union and its satellite countries. I have been privileged to witness this transition from a Centrally Planned Economy to a Market Economy a few times and always found that the process was incredibly similar. Map of Russia (former Soviet Union) and Asia. Mongolia became the Soviet Union's first satellite state in 1921. Source of map: I Like 2 Learn. Initially, the cars would get bigger (and imported) the shops will be filled up with imported luxury goods that no one could afford, clothes would get more colourful, skirts shorter... but the constant factor that took place throughout the ex-Soviet countries was that eventually property would be privatised and start from an extremely low base and grow astronomically for a few years. When I first arrived in Mongolia by train in 2004, that transition was just starting, it was in the air and on the streets. People busy being entrepreneurs earning a little money here and there but essentially laying the foundations for tomorrow's mega corporations. As soon as I walked around the streets of Ulaanbaatar I felt that this was the place to be, did some more research and came over to Mongolia to work in its property sector soon thereafter. I have never looked back and have enjoyed immensely my time here and look forward to being a key player in the future growth of Mongolia's Real Estate sector. 20 - What in your background makes you uniquely suited to maximize the opportunities that exist in Mongolia? Mr. de Gruben: Its not really me but rather the M.A.D. Investment Solutions executive team that makes us uniquely suited to maximise the opportunities that exist in Mongolia. I am the eternal optimist willing to launch into any venture that looks remotely exciting while my partner Joachim is constantly pessimistic and cautious. We argue, fight and debate throughout the day but eventually find the best way to move forward. We further benefit from the incredible logistical support and networking ability of our Mongolian partner, Uyanga to make all our crazy ideas come true, be well structured and most importantly bring us the very best deals in the city. Only those investors that would have met us will really understand the synergies that we have within our team, we have been lucky to bring together various key skills and competences that makes us today one of the best bets on the market. Thank you for the taking the time to share all that information Chris. For readers seeking further information from Mr. de Gruben, he can be contacted here. © Jon Springer 2012. All rights reserved. Please contact for republication. Further Data: A complete list of my articles and blogs on Mongolia appears at the top of this page. At the bottom of the page in the comments there is a weekly update of investing news about Mongolia. Disclosure: I am long IVN, MNGGF.PK. Additional disclosure: I am also long OPP.L. ResCap securities is working with M.A.D. Investment Solutions to bring Real Estate Mongolia to the market. Origo Partners (OPP.L) owns a portion of ResCap. I have a pending purchase order for Asia Pacific Properties, a subsidiary of Asia Pacific Investment Partners listed on the Mongolia Stock Exchange. I have brokerage accounts with Asia Pacific Securities (a subsidiary of Asia Pacific Investment Partners) and Frontier Securities (whose data was used in images within this interview). No trades in any companies or entities mentioned in this interview will be made in the 72 hours prior to or after the publication by the author/interviewer with the sole possible exception of Asia Pacific Properties if a trading freeze on the security is removed. I receive no compensation to write about any specific stock, sector or theme.